Geek Grotto - Get Your Geek On! : Rail Wars Licensed! Sentai Filmworks is on a roll! Another new series that JUST started airing in Japan, Rail Wars, will be available "soon"! 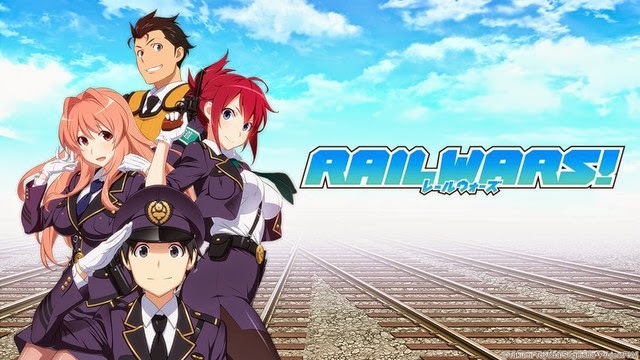 HOUSTON, July 5, 2014 – A new recruit will learn the ropes on the field when his new job goes seriously off track in Sentai Filmworks' latest acquisition, Rail Wars! This comedy action series is directed by Yoshifumi Sueda (Knights of Sidonia, Pocket Monster XY) with series composition by Masashi Suzuki (Hayate the combat butler! Cuties, The Ambition of Oda Nobuna), art direction by Yukihiro Watanabe (Love Live! School Idol Project, A-Channel) and animation production by Passione ( Haitai Nanaha, Little Battlers eXperience W).